Hello, Friday!!! It's going to be a beautiful day, and we have a fun weekend ahead of us! It involves shopping, hanging out with friends, and taking my girls to see the new Cinderella movie. We're looking forward to making some memories! St. Patrick's Day! We're Irish, we have kids, and I go crazy on holidays...of course we're going to celebrate! I went shopping over the weekend, and picked up some new St. Patrick's Day decor. I love the way this shelf turned out! I picked up a few new things for the rest of the house, too. My St. Patrick's Day decoration supply was seriously lacking. I couldn't pass up the 50% off sale at Michael's! Check back next week to see how we celebrate! We have a lot of fun stuff planned! That sweet little smile is my FAVORITE, but I also wanted to share a new product that I love! Liam pooped overnight, and was really red when I changed his diaper. I pulled out the Triple Wash that someone had given me, and tried it for the first time. I added a few drops to his bath water, and let him soak in it for about 5 minutes. I swear, it worked! When I took him out of the bath, he was a lot less red, he smelled delicious, and his skin was SO soft. If you have a child in diapers, get some!!! 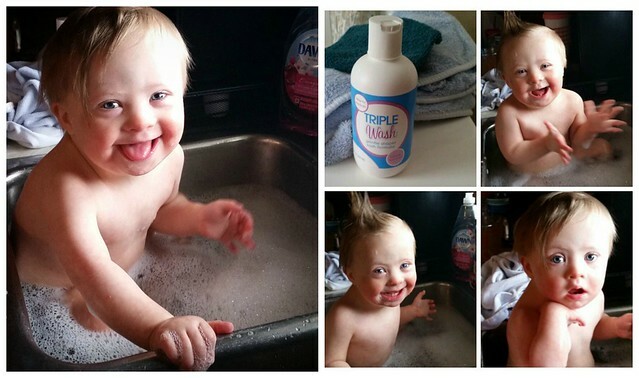 Fortunately, he only had two diaper rashes in his entire life, but this stuff is great! Our bathroom renovation is in full swing. 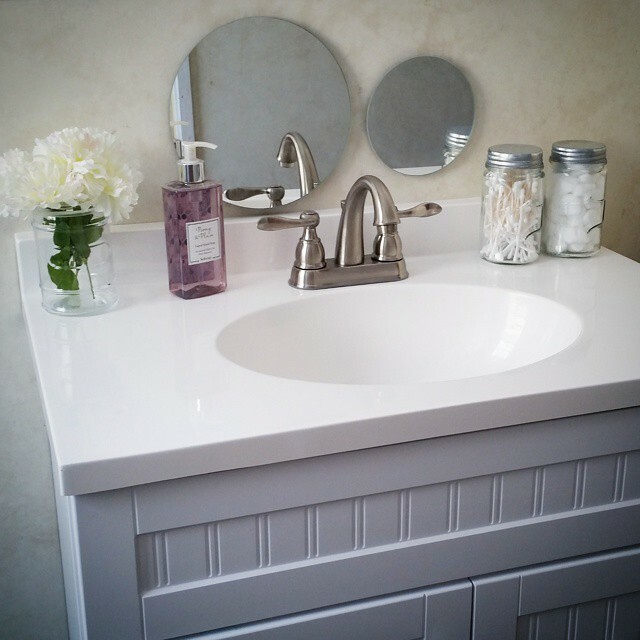 The new vanity and faucet is installed, and we started putting down the new flooring. We still have to finish the floor, paint, and put up the wainscoting, but it's getting close! We originally planned to put a backsplash behind the sink, but I found a few unopened boxes of these round mirrors that I had stored away in the attic. There are about 10 round mirrors in different sizes (the ones shown are the biggest). We never used them for anything. On a whim, I decided to see how secure they were, and I loved the look of something different. I'm going to create a mirrored "backsplash" with them after we finish the walls. I know, I know, all the streaks (!!! ), but I'm one of those OCD people that wipe down my bathroom sink and wall behind it once or twice a day! Quality time with family and friends! 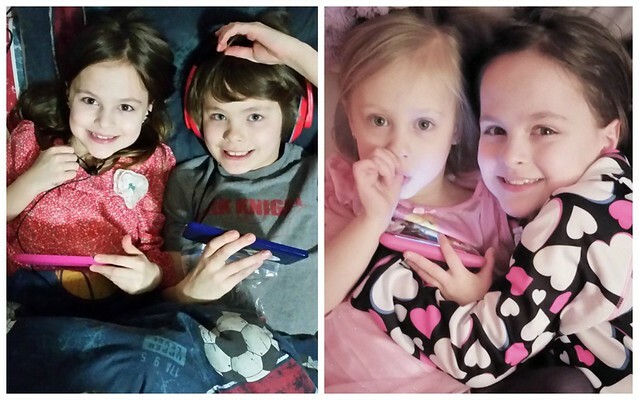 I love how close my kids are. (Reality check...they do bicker, too!) BUT...they love each other so much! 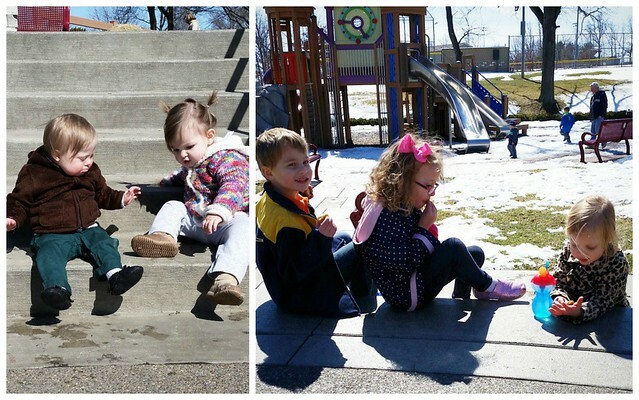 Yesterday, we had our first outdoor playdate of the year! The kids had a great time at the park, and sitting in the sunshine while talking to my closest friends felt amazing after this long, frigid winter! 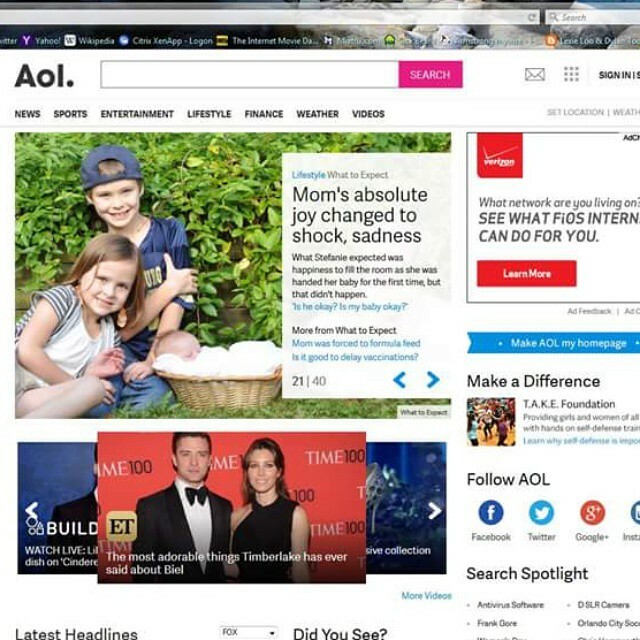 AOL featured Liam's birth story on their homepage again this week! It was originally featured there in October 2013, shortly after Liam was born. Just like last time, I received so many emails from people who wanted to share their personal experiences and stories or just let me know that our story touched them. I sat there, reading email after email, with tears streaming down my cheeks. Yes, there are always a few ugly comments, but all those incredible emails, Facebook messages, and Facebook comments make it worth it. I'm so thankful for some new friends I've made in the past few days! Just in case you were wondering, life with Down Syndrome is not as scary as it's made out to be. We are LOVING this journey! 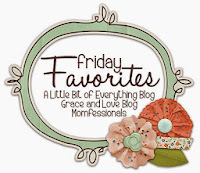 Congrats on being featured, so exciting! Liam's smile is the sweetest! Have fun at the movie with your girls! Thank you! I hope you're enjoying your weekend! Oh my gosh those tub pictures of Liam! 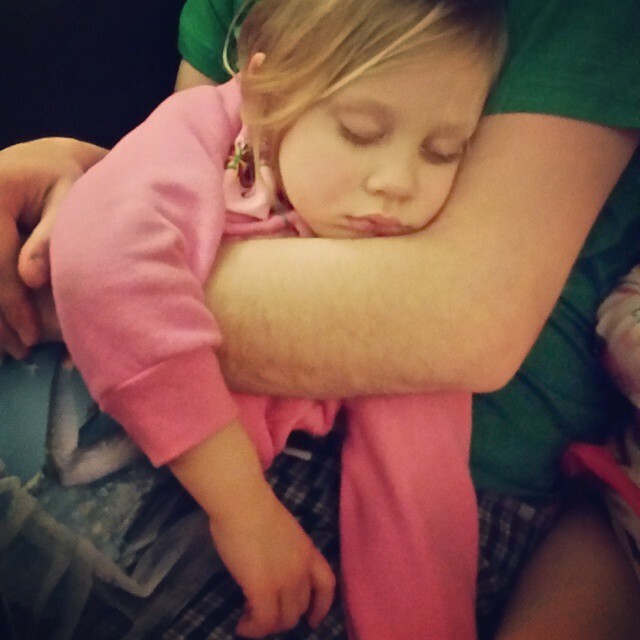 I can't even handle the cuteness. I'm going to have to give that product a try. Violet gets rashes SO easily. Love the holiday decorations too! Thank you, Erin! Have a great weekend! I love all the green. I was looking around my house yesterday and decided it's time to add some "spring" to my house. One more week and Spring will be here! Woohoo!!! Have a great weekend! It looks like you're getting ready for St. Patty's Day! I just love how your bathroom renovation is turning out...and, of course, of course, congrats for being featured again! Your story is so honest and beautiful; it's a true testament to the wonderful, strong, caring, positive mom that you truly are! You are so sweet! Thank you! I hope you're having a great weekend! 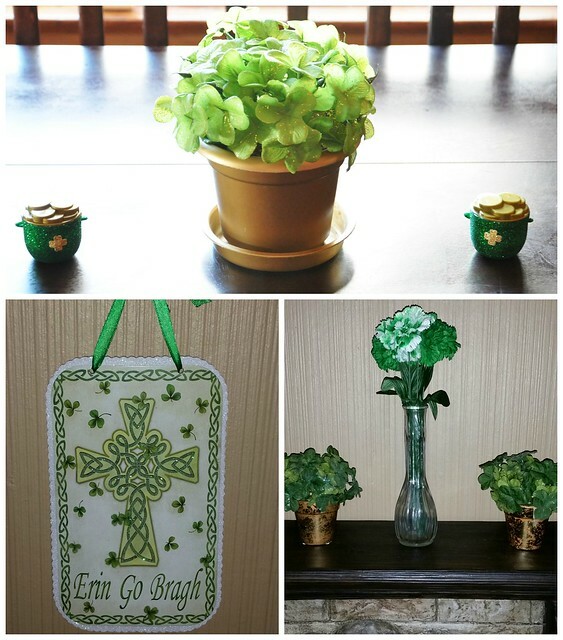 Love all of your St. Patricks decor, it looks GREAT. How cool is that to be featured again, congratulations.